I really like serving hors d’oeuvres that fall in the finger food category, so that when my guests are socializing they can easily nosh without the awkwardness of having to balance their drink and food. Sometimes I day dream about replicating gorgeous looking canapé appetizers that I come across on Pinterest. The truth is though, when it comes to hosting dinner parties, I spend so much time, and effort, on my main meal that I am left with little time for fancy appetizers. There is also another realistic issue: Somehow, gorgeous looking hors d’oeuvres on Pinterest are often difficult to replicate. Anyhow, I am a fan of cheese. I am a fan of bread. I love any type of flavorful spreadable cheese on bread. 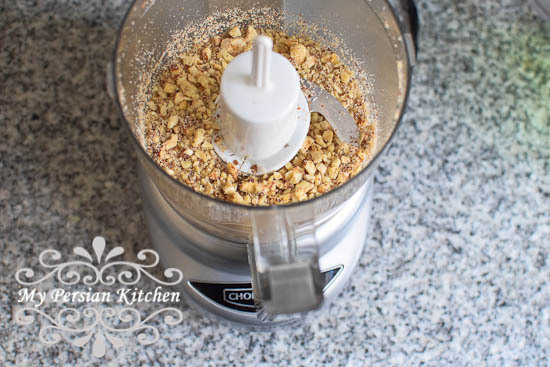 I also love to experiment with different flavors, specifically, I love to marry my favorite nuts with fragrant fresh herbs. Often times I experiment with what I already have on hand. Last week, I had a bag of hazelnuts that needed to be used; additionally, we are fortunate to have a bounty of tarragon growing in our vegetable box. While this combination might sound unusual, I promise you it is incredibly good. 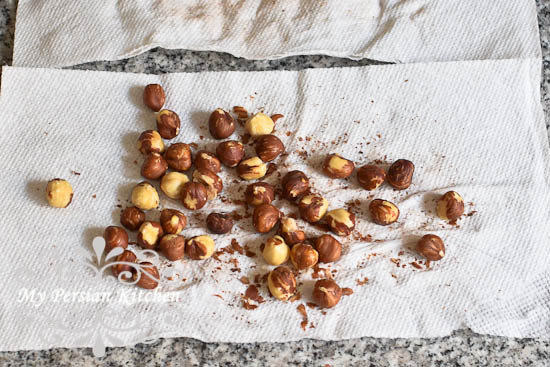 It is important to toast the hazelnuts to maximize their flavor, but also remove the loose skin. 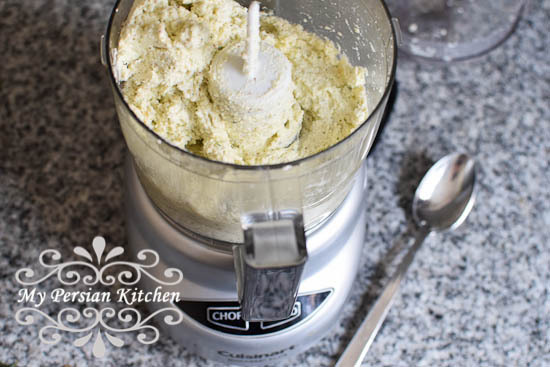 Having a food processor certainly makes this part of the recipe easy. 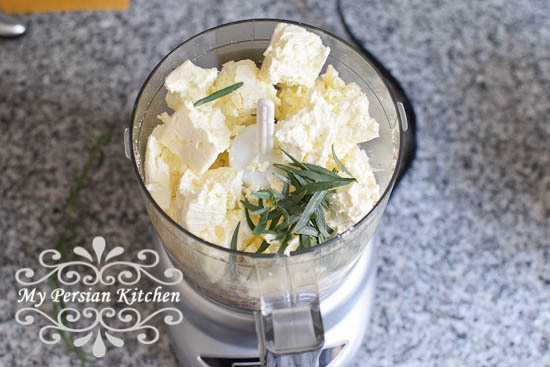 It’s amazing how three simple ingredients can be so incredibly delicious together. This is the desired consistency of the spread. Just like dough, you know it’s done when it all comes together into a lump. 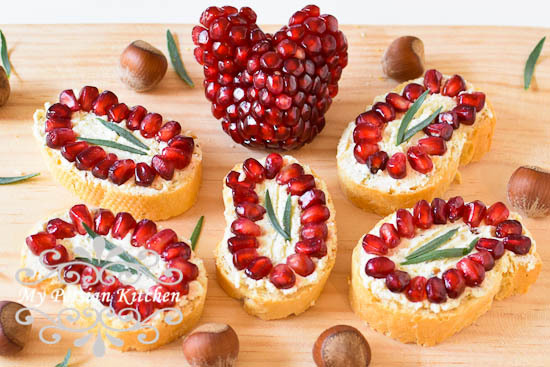 Spread the cheese on top of the toasted slices of bread, then top with pomegranates. 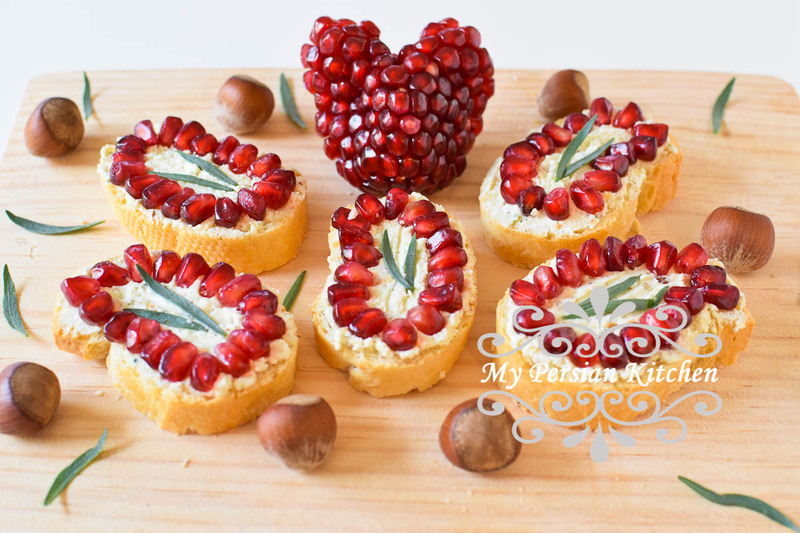 Of course, you can get creative with the way you decorate the pomegranates on top of the crostini. This is definitely an easy appetizer to make that will wow your guests. Below are fantastic recipes created by the Persian Food Bloggers for this year’s Shabeh Yalda!